£15 online gift voucher. D for Dog Gift eVouchers to give to friends and family to spend at D for Dog. Can't decide what to buy as a special gift for a dog loving friend? Need to send a gift in a hurry? 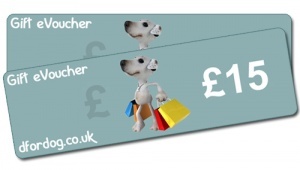 Why not buy them a D for Dog Gift eVoucher.